It is plum frightening to think how much I’d be missing if I weren’t a grandma!!! 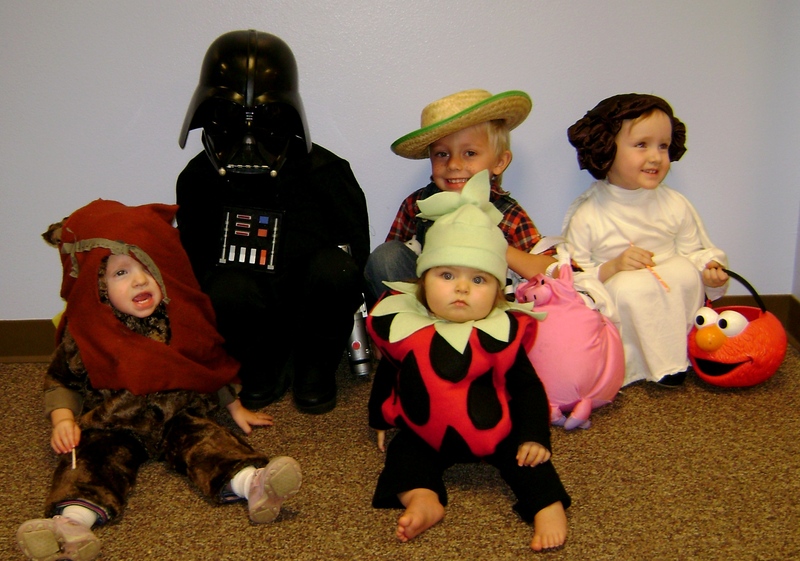 Pictured – the grandbabies at the church HarvestFest tonight: Gavin as Darth Vadar, Hunter as a farmer who takes care of animals, Guini as Princess Leia, Gemma as an Ewok and Averi is a strawberry! Kudos to their wonderful mommies (those are my girls!!) for creating all of these costumes for their kids. Who knew they’d be so talented? Well, me actually! Oh, my! I LOVE this shot! You are so blessed. There are so many days Wrex and I want to skip the kids part and go right to the grandkids! ;) What fun! LOVE this picture! Wish we could have seen them – but we were at Robby’s wedding. Thank you for sharing this wonderful photo of your grandchildren!